Hello, my name is Aimee Huff. I am a senior at the Cincinnati Zoo Academy. Yes, you heard me correctly, the Zoo Academy. Not many people know a school like that actually exists. It’s amusing. The Zoo Academy has been run for over 30 years! And not a lot of people know about this amazing and unique program. The Zoo Academy offers a lot of opportunities and gives you personal experience with what keepers in the zoo go through and what tasks have to be done each day. It offers more than a typical high school offers. If you haven’t heard the Cincinnati Zoo & Botanical Garden is ranked as one of the best zoos in the country! How cool is that? I’ve learned so much and had great experiences here at the Zoo Academy so far. One of the experiences that I will always keep with me is watching Suci the Sumatran rhino receive an ultrasound. It was an experience that was emotional, yet joyful at the same time. Dr. Roth went through a lot of tribulations to get Suci to ovulate successfully. I had the opportunity to see Dr. Roth in action. Since I was only a student, there wasn’t much I could do, but stand there in amazement. Dr. Roth had a lot of equipment set up. It was like a miniature version of a hospital. 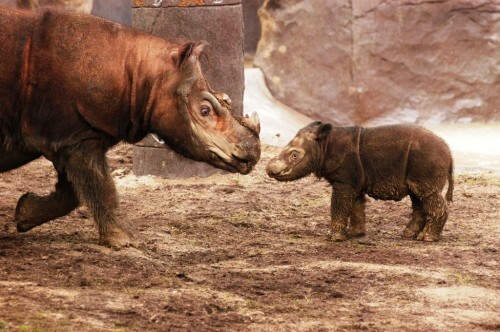 They were doing an ultrasound on the Sumatran rhino because as you must know, Sumatran rhinos are on the brink of extinction, and the Cincinnati Zoo wants this species to live on. Especially, here. Holding the rhino in one place for a series of hours is a serious matter and tough work. So, in order for them to get Suci to cooperate, they treated her with yummy fruit and veggies. I remember asking one of the keepers if I could pet her while he was feeding her; he said no because that would probably irritate her. And they obviously did not want that happen. During the series of tests, I also remember Suci secreting a lot of vaginal liquid. We weren’t sure if she was urinating or if she was actually ovulating. So Dr. Roth asked one of the keepers to collect some of the liquid she was secreting all over the floor in her enclosure. I have also been able to work with my favorite animal at the Cincinnati Zoo. Can you guess what it is? 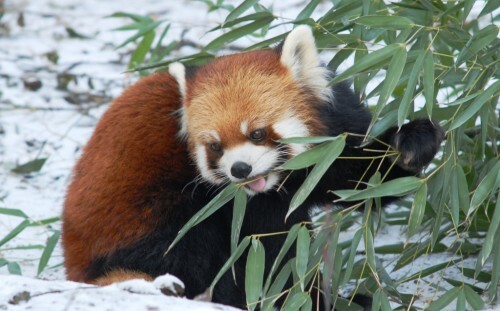 You guessed it, the red panda! I was really happy to have the opportunity to work with the red pandas. I chose to do my yearlong project on the red panda and being in that lab made it easy and convenient for me to collect and gather information about the animal. You’re probably wondering why I would do a project about red pandas. I chose to do a project about these animals because not only are they my favorite creature in the Cincinnati Zoo, but they are also the most vulnerable ones as well. Red pandas are on the brink of extinction because their land is being destroyed and due to climate change. Climate change is proceeding faster at higher elevations, and this could possibly destroy their region. The red panda is an animal that is most likely to be ignored in zoos because they are most active in the winter when there aren’t a lot of people at the zoo. 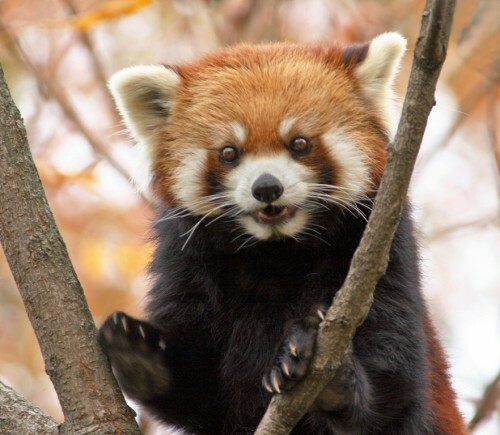 I feel that we should protect them because red pandas are just too unique and important to their habitat. So, I came up with an idea of creating a class for kids ages 8 to 11 that offers information about these animals to raise awareness. I made up activities and a song for the group of kids. The class is scheduled for March 3rd. It’s advertised on the Cincinnati Zoo website and people who are interested can sign up online or go to the information desk in the Education Center. I will get to help with the class. I am hoping more kids sign up. I’m really excited about this! GIANT insects at the Cincinnati Zoo! Aimee, I also got to see Suci get an ultrasound during a behind the scenes zoo tour. It was a very special moment for me having watched Suci and her mother,Emi, years ago on a webcam. We watched Suci her entire first year growing up. It was so amazing to watch the Sumatran rhinos, and we would often visit them at the zoo, as well as the red pandas, and all the other amazing wildlife at at the zoo. All that webcam viewing turned me into a real rhino fan! Now I have severe chronic pain,but I write fictional rhino stories which I hope to use to aid conservation, and I am very involved in three rhino groups on FaceBook. I hope you continue your study of animals and hang on to that curiosity and passion and with some hard work you will go far! Keep up the good work! Great information! I am among one who was not aware of such academy, thanks for sharing it.